The Urartian or Vannic language was spoken by the inhabitants of the ancient kingdom of Urartu, located in the region of Lake Van, with its capital near the site of the modern town of Van, in the Armenian Highland, modern-day Eastern Anatolia region of Turkey. It was probably dominant around Lake Van and in the areas along the upper Zab valley. First attested in the 9th century BCE, Urartian ceased to be written after the fall of the Urartian state in 585 BCE, and presumably it became extinct due to the fall of Urartu. It must have been replaced by an early form of Armenian, perhaps during the period of Achaemenid Persian rule, although it is only in the fifth century CE that the first written examples of Armenian appear. Urartian was an ergative, agglutinative language, which belongs to neither the Afroasiatic nor the Indo-European families but to the Hurro-Urartian family (whose only other known member is Hurrian). It survives in many inscriptions found in the area of the Urartu kingdom, written in the Assyrian cuneiform script. There have been claims of a separate autochthonous script of "Urartian hieroglyphs" but they remain unsubstantiated. Urartian is closely related to Hurrian, a somewhat better documented language attested for an earlier, non-overlapping period, approximately from 2000 BCE to 1200 BCE (written by native speakers until about 1350 BCE). The two languages must have developed quite independently from approximately 2000 BCE onwards. Although Urartian is not a direct continuation of any of the attested dialects of Hurrian, many of its features are best explained as innovative developments with respect to Hurrian as it is known from the preceding millennium. The closeness holds especially true of the so-called Old Hurrian dialect, known above all from Hurro-Hittite bilingual texts. Igor Diakonoff and others have suggested ties between the Hurro-Urartian languages and the Northeastern Caucasian languages. Several studies argue that the connection is probable. Other scholars, however, doubt that the language families are related, or believe that, while a connection is possible, the evidence is far from conclusive. Indo-European (namely Armenian and Anatolian, as well as Iranian and possibly Paleo-Balkan) etymologies have been proposed for many Urartian personal and topographic names, such as the names of kings Arame and Argishti, regions such as Diauehi and Uelikulqi, and cities such as Arzashkun, as well as some Urartian vocabulary. 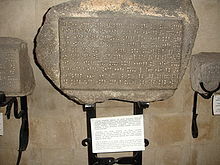 The German scholar Friedrich Eduard Schulz, who discovered the Urartian inscriptions of the Lake Van region in 1826, made copies of several cuneiform inscriptions at Tushpa, but made no attempt at decipherment. After the decipherment of Assyrian cuneiform in the 1850s, Schulz's drawings became the basis of deciphering the Urartian language. It soon became clear that it was unrelated to any known language, and attempts at decipherment based on known languages of the region failed. The script was finally deciphered in 1882 by A. H. Sayce. The oldest of these inscriptions is from the time of Sarduri I of Urartu, whose title was 'King of the Four Quarters'. Decipherment only made progress after World War I, with the discovery of Urartian-Assyrian bilingual inscriptions at Kelišin and Topzawä. In 1963, a grammar of Urartian was published by G. A. Melikishvili in Russian, appearing in German translation in 1971. In the 1970s, the genetic relation with Hurrian was established by I. M. Diakonoff. The oldest delivered texts originate from the reign of Sarduri I, from the late 9th century BCE. and were produced until the fall of the realm of Urartu approximately 200 years later. Approximately two hundred inscriptions written in the Urartian language, which adopted and modified the cuneiform script, have been discovered to date. Urartian cuneiform is a standardized simplification of Neo-Assyrian cuneiform. Unlike in Assyrian, each sign only expresses a single sound value. The sign gi 𒄀 has the special function of expressing a hiatus, e.g. u-gi-iš-ti for Uīšdi. A variant script with non-overlapping wedges was in use for rock inscriptions. Urartian was also rarely written in the "Anatolian hieroglyphs" used for the Luwian language. Evidence for this is restricted to Altıntepe. There are suggestions that besides the Luwian hieroglyphic inscriptions, Urartu also had a native hieroglyphic script. The inscription corpus is too sparse to substantiate the hypothesis. It remains unclear whether the symbols in question form a coherent writing system, or represent just a multiplicity of uncoordinated expressions of proto-writing or ad-hoc drawings. What can be identified with a certain confidence are two symbols or "hieroglyphs" found on vessels, representing certain units of measurement: for aqarqi and for ṭerusi. This is known because some vessels were labelled both in cuneiform and with these symbols. There were presumably also the semivowels /w/ and /y/. As usual with ancient languages, the exact nature and pronunciation of the consonants are uncertain. As the table shows, the stops and the sibilants all display a three-way distinction between voiced, voiceless and "emphatic" consonants, but it cannot be ascertained what was special about the third groups of consonants, which were rendered with the Akkadian cuneiform signs for the Semitic emphatics. Perhaps they were glottalized or aspirated. The pronunciation of the sibilants is debatable, as it is for Akkadian; some may actually have been affricates. The script distinguishes the vowels a, e, i and u. It is unclear whether there was an /o/ as well. There may have been phonemic vowel length, but it is not consistently expressed in the script. Word-finally, the distinction between e and i is not maintained, so many scholars transcribe the graphically vacillating vowel as a schwa: ə, while some preserve a non-reduced vowel (usually opting for i). The full form of the vowel appears when suffixes are added to the word and the vowel is no longer in the last syllable: Argištə "Argišti" - Argištešə "by Argišti (ergative case)". This vowel reduction also suggests that stress was commonly on the next-to-the-last syllable. In the morphonology, various morpheme combinations trigger syncope: *ar-it-u-mə → artumə, *zaditumə → zatumə, *ebani-ne-lə → ebanelə, *turul(e)yə → tul(e)yə. The morphemes which may occur in a noun follow a strict order: stem - article - possessive suffix - number and case suffix - suffixes received through Suffixaufnahme. All nouns appear to end in a so-called thematic vowel - most frequently -i or -e, but -a and -u also occur. They may also end in a derivational suffix. Notable derivational suffixes are -ḫə, forming adjectives of belonging (e.g. Abiliane-ḫə "of the tribe Abiliani", Argište-ḫə "son of Argišti") and -šə, forming abstract nouns (e.g. alsui-šə "greatness", ardi-šə "order", arniu-šə "deed"). The forms of the so-called "article" are -nə (non-reduced form -ne-) for the singular, -ne-lə for the plural in the absolutive case and -na- for the other forms of the plural. They are referred to as "anaphoric suffixes" and can be compared to definite articles, although their use does not always seem to match that description exactly. They also obligatorily precede agreement suffixes added through Suffixaufnahme: e.g. Argište-šə Menua-ḫi-ne-šə "Argišti (ergative), son of Menua (ergative)". The plural form can also serve as a general plural marker in non-absolutive cases: arniuši-na-nə "by the deeds". The well-attested possessive suffixes are the ones of the first person singular -ukə (in non-reduced form sometimes -uka-) and -i(yə) (in non-reduced form sometimes -iya-): e.g. ebani-uka-nə "from my country", ebani-yə "his country". The plural is expressed, above all, through the use of the plural "article" (-ne-lə in the absolutive case, -na- preceding the case suffix in the oblique cases), but some of the case suffixes also differ in form between the singular and the plural. Therefore, separate plural version of the case suffixes are indicated below separately. The nature of the absolutive and ergative cases is as in other ergative languages (more details in the section Syntax below). Since the "complete" plural forms also include the plural definite article, they appear as -ne-lə, -na-šə, -na-wə, na-(e)də or na-š-tə, etc..
A phenomenon typical of Urartian is Suffixaufnahme - a process in which dependent modifiers of a noun (including genitive case modifiers) agree with the head noun by absorbing its case suffixes. The copied suffixes must be preceded by the article (also agreeing in number with the head). Examples: Ḫaldi-i-na-wə šešti-na-wə "for the gates (dative) of [god] Ḫaldi (dative)", Argište-šə Menua-ḫi-ne-šə "Argišti (ergative), son of Menua (ergative)". The known personal pronouns are those of the first and third person singular. The first person singular has two different forms for the absolutive case: ištidə as the absolutive subject of an intransitive verb, and šukə as the absolutive object of a transitive verb. The ergative form is iešə. Judging from correspondences with Hurrian, šu- should be the base for the "regular" case forms. An enclitic dative case suffix for the first person singular is attested as -mə. The third person singular has the absolutive form manə. As for possessive pronouns, besides the possessive suffixes (1st singular -uka- and 3rd singular -iya) that were adduced above, Urartian also makes use of possessive adjectives formed with the suffix -(u)sə: 1st singular šusə, 3rd singular masə. The encoding of pronominal ergative and absolutive participants in a verb action is treated in the section on Verbal morphology below. Demonstrative pronouns are i-nə (plural base i-, followed by article and case forms) and ina-nə (plural base ina-, followed by article and case forms). A relative pronoun is alə. The paradigm of the verb is only partially known. As with the noun, the morphemes that a verb may contain come in a certain sequence that can be formalized as a "verb chain": root - root complements (of unclear meaning) - ergative third person plural suffix - valency markers (intransitive/transitive) - other person suffixes (expressing mostly the absolutive subject/object). It is not clear if and how tense or aspect were signalled. The valency markers are -a- (rarely -i-) for intransitivity and -u- for transitivity: for example nun-a-də "I came" vs šidišt-u-nə "he built". A verb that is usually transitive can be converted to intransitivity with the suffix -ul- before the intransitive valency marker: aš-ul-a-bə "was occupied" (vs aš-u-bə "I put in [a garrison]"). Examples: ušt-a-də "I marched forth"; nun-a-bə "he came"; aš-u-bə "I put-it in"; šidišt-u-nə "he built-it"; ar-u-mə "he gave [it] to me", kuy-it-u-nə "they dedicated-it". As the paradigm shows, the person suffixes added after the valency vowel express mostly the person of absolutive subject/object, both in intransitive and in transitive verbs. However, the picture is complicated by the fact that the absolutive third person singular is expressed by a different suffix depending on whether the ergative subject is in the first or third person. An additional detail is that when the first-person singular dative suffix -mə is added, the third-person singular absolutive suffix -nə is dropped. It should also be noted that the encoding of the person of the absolutive subject/object is present, even though it is also explicitly mentioned in the sentence: e.g. argište-šə inə arə šu-nə "Argišti established(-it) this granary". An exceptional verb is man- "to be", in that it has a transitive valency vowel, and takes no absolutive suffix for the third person singular: man-u "it was" vs man-u-lə "they were". The imperative is formed by the addition of the suffix -ə to the root: e.g. ar-ə "give!". The jussive or third person imperative is formed by the addition of the suffix -in in the slot of the valency vowel, whereas the persons are marked in the usual way, following an epenthetic vowel -[i]-:e.g. ar-in-[i]-nə "may he give it", ḫa-it-in-nə "may they take it". The modal suffix -l-, added between the valency vowel and the person suffixes, participates in the construction of several modal forms. An optative form, also regularly used in clauses introduced with ašə "when", is constructed by -l- followed by -ə (-i in non-reduced form) - the following absolutive person suffix is optional, and the ergative subject is apparently not signalled at all: e.g. qapqar-u-l-i-nə "I wanted to besiege-it [the city]", urp-u-l-i-nə or urp-u-l-ə "he shall slaughter". A conditional is expressed by a graphically similar form, which is, however, interpreted by Wilhelm (2008) as -l- followed by -(e)yə: an example of its use is alu-šə tu-l-(e)yə "whoever destroys it". Finally, a desiderative, which may express the wish of either the speaker or the agent, is expressed by -l- followed by a suffix -anə; in addition, the valency marker is replaced by -i-: e.g. ard-i-l-anə "I want him to give …", ḫa-i-l-anə "it wants to take/conquer …". Negation is expressed by the particle ui, preceding the verb. A prohibitative particle, also preceding the verb, is mi. mi is also the conjunction "but", whereas e'ə is "and (also)", and unə is "or". Participles from intransitive verbs are formed with the suffix -urə, added to the root, and have an active meaning (e.g. ušt-u-rə "who has marched forth"). Participles from transitive verbs are formed with the suffix -aurə, and have a passive meaning (e.g. šidaurə "which is built"). It is possible that -umə is the ending of an infinitive or a verb noun, although that is not entirely clear. Urartian is an ergative language, meaning that the subject of an intransitive verb and the object of a transitive verb are expressed identically, with the so-called absolutive case, whereas the subject of a transitive verb is expressed with a special ergative case. Examples are: Argištə nun-a-bi "Argišti came" vs Argište-šə arə šu-nə "Argišti established a granary". Within the limited number of known forms, no exceptions from the ergative pattern are known. The word order is usually verb-final, and, more specifically, SOV (where S refers to the ergative agent), but the rule is not rigid and components are occasionally re-arranged for expressive purposes. For example, names of gods are often placed first, even though they are in oblique cases: Ḫaldi-ə ewri-ə inə E2 Argište-šə Menuaḫini-šə šidišt-u-nə "For Ḫaldi the lord Argišti, son of Menua, built this temple." Verbs can be placed sentence-initially in vivid narratives: ušt-a-də Mana-idə ebanə at-u-bə "Forth I marched towards Mana, and I consumed the land." Nominal modifiers usually follow their heads (erelə tarayə "great king"), but deictic pronouns such as inə precede them, and genitives may either precede or follow them. Urartian generally uses postpositions (e.g. ed(i)-i-nə "for", ed(i)-i-a - both originally case forms of edi "person, body" - pei "under", etc..) which govern certain cases (often ablative-instrumental). There is only one attested preposition, parə "to(wards)". Subordinate clauses are introduced by particles such as iu "when", ašə "when", alə "that which". The sample below is from inscription 372 by Menua, son of Ishpuini, based on G. A. Melikishvili's corpus of Urartian Cuneiform Inscriptions. For each sentence, the transliteration is given in Italic, the morphological transcription in bold, the translation in a plain font. Ḫaldi=ni=nə ušma=ši=nə Menua=šə Išpuini=ḫi=ni=šə Ḫaldi=ni=lə KÁ šidišt=u=alə. "Through Haldi's might, Menua, son of Ishpuini, built Haldi's gates." "For (the city of) Aludiri he built a fortress to its perfection (?)." Ḫaldi=ni=nə ušma=ši=nə Ḫaldi=ni=nə bau=ši=nə Menua=nə Išpuini=ḫə iu ate=y=n(ə)=ə esi=ə naḫ=a=bə, Šatiru=nə durbayə man=u. "When, through Haldi's might and Haldi's command, Menua, son of Ishpuini, ascended to his father's place (i.e. throne), (the land of) Šatiru was rebellious." "Haldi marched forth with his weapon(? ), conquered Huradinaku, conquered Gidimaru, conquered the land of Shatiru. Haldi is powerful, Haldi's weapon(?) is powerful." Ḫa=u=nə Ḫuradinaku=nə, Gidimaru=nə, ḫa=u=nə Šatiru=yə eban=i=yə Tarzuana-nə. "He (Menua) captured (the cities) Huardinaku, Gidimaru, Tarzuana of the land of Shatiru." Kuṭ=u=nə parə Buštu=ə, parə Malmali=ə. "He reached as far as (the city of) Buštu, as far as (the city of) Malmali." Ḫuradinaku=nə … ar=u=nə Ḫaldi=šə Menua=ə Išpuini=ḫi=ni=ə. Haldi gave (the city of) Huradinaku to Menua, son of Ishpuini." ^ Hammarström, Harald; Forkel, Robert; Haspelmath, Martin, eds. (2017). "Urartian". Glottolog 3.0. Jena, Germany: Max Planck Institute for the Science of Human History. ^ Wilhelm, Gernot. 2008. Urartian. In Woodard, Roger D. (ed.) The Ancient Languages of Asia Minor. P.105. "Neither its geographical origin can be conclusively determined, nor the area where Urartian was spoken by a majority of the population. It was probably dominant in the mountainous areas along the upper Zab Valley and around Lake Van." ^ Wilhelm, Gernot. 2008. Hurrian. In Woodard, Roger D. (ed.) The Ancient Languages of Asia Minor. P.106: "We do not know when the language became extinct, but it is likely that the collapse of what had survived of the empire until the end of the seventh or the beginning of the sixth century BCE caused the language to disappear." ^ Clackson, James P. T. 2008. Classical Armenian. In: The languages of Asia Minor (ed. R. D. Woodard). P.125. "Speakers of Armenian appear to have replaced an earlier population of Urartian speakers (see Ch. 10) in the mountainous region of Eastern Anatolia. ... We have no record of the Armenian language before the fifth century AD." ^ Clackson, James P. T. 2008. Classical Armenian. In: The languages of Asia Minor (ed. R. D. Woodard). P.125. "The extralinguistic facts relevant to the prehistory of the Armenian people are also obscure. Speakers of Armenian appear to have replaced an earlier population of Urartian speakers (see Ch. 10) in the mountainous region of Eastern Anatolia. The name Armenia first occurs in the Old Persian inscriptions at Bīsotūn dated to c. 520 BCE (but note that the Armenians use the ethnonym hay [plural hayk‘] to refer to themselves). We have no record of the Armenian language before the fifth century CE. The Old Persian, Greek, and Roman sources do mention a number of prominent Armenians by name, but unfortunately the majority of these names are Iranian in origin, for example, Dādrši- (in Darius’ Bīsotūn inscription), Tigranes, and Tiridates. Other names are either Urartian (Haldita- in the Bīsotūn inscription) or obscure and unknown in literate times in Armenia (Araxa- in the Bīsotūn inscription)." ^ Вестник древней истории, № 3, 1977 г. .
C. B. F. Walker: Reading the Past: Cuneiform. British Museum Press, 1996, ISBN 0-7141-8077-7. J. Friedrich: "Urartäisch", in Handbuch der Orientalistik I, ii, 1-2, pp. 31–53. Leiden, 1969. Gernot Wilhelm: "Urartian", in R. Woodard (ed. ), The Cambridge Encyclopedia of the World’s Ancient Languages. Cambridge, 2004. Mirjo Salvini: Geschichte und Kultur der Urartäer. Wissenschaftliche Buchgesellschaft, Darmstadt, 1995. Jeffrey J. Klein, "Urartian Hieroglyphic Inscriptions from Altintepe", Anatolian Studies, Vol. 24, (1974), 77-94. Wikimedia Commons has media related to Urartian language.